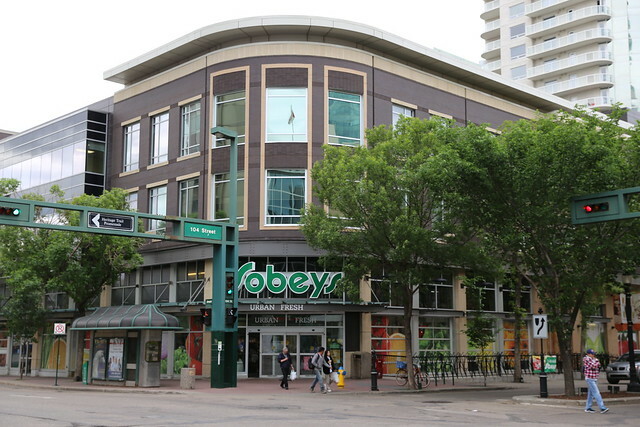 After six years of serving the central downtown Edmonton area, Sobeys will close its 104 Street location on July 31. It’s a disappointing end to a store that, while full of promise at its launch in May 2008, never really lived up to its potential. It’s also a high profile loss for 104 Street, which has seen a number of businesses close over the last year or so, and a potential setback for Edmonton’s ongoing downtown revitalization. Why has Sobeys decided to close the 104 Street location? The bottom line is…it’s all about the bottom line. 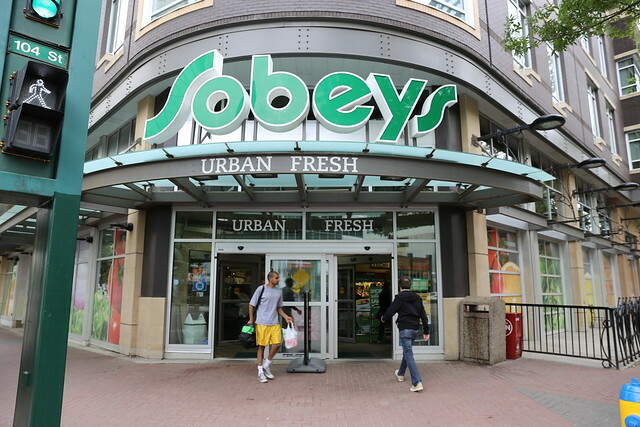 Sobeys is planning to close three other stores in Edmonton as well: Sobeys Mainstreet in Mill Woods at 6440 28 Avenue, Heritage Sobeys at 2011 111 Street, and Clock IGA at 15445 Stony Plain Road. Employees received letters upon arriving at work yesterday informing them of the planned closures. They’ll have the option of transferring to another location. “We have a lot of vacancies at other stores in Edmonton,” Keri said. In order to get approval for its purchase of Safeway Canada, Sobeys agreed to sell 30 stores in Western Canada. Co-op agreed to purchase three stores in Edmonton and another three in the region, and the fact that the 104 Street location wasn’t one of them was seen as a vote of confidence from Sobeys. Now Sobeys has made it clear that assumption was invalid. Two Urban Fresh locations in Toronto are also closing, but the second Edmonton location at College Plaza will remain open, as will ten other locations throughout Ontario. At the start, it seemed as though Sobeys wouldn’t have any problem attracting customers. 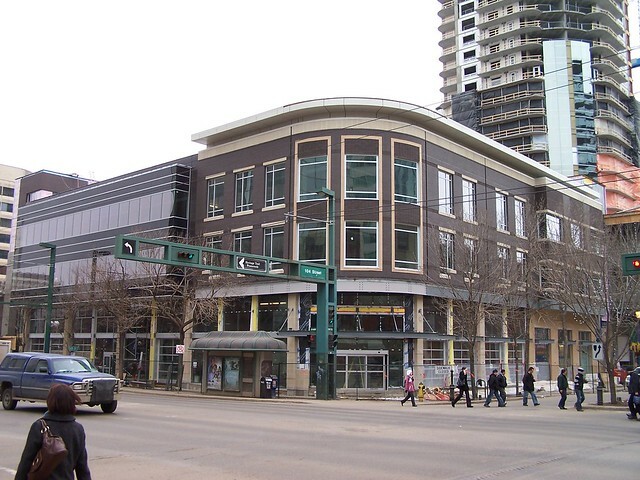 “Again and again, the staff at the front door of the new Sobeys on Jasper Avenue and 104th Street smile and apologize, as they turn away would-be customers,” Paula Simons wrote in May 2008, just days before the store officially opened to the public. When it first opened, the Sobeys on 104 Street was meant to bring a European-style market to downtown. It was the first location to bring Sobeys’ “urban fresh” concept to life – smaller, featuring local food, more prepared items, a cafe, and other urban-friendly amenities. Relationships with the popular City Market were touted, and excitement was high. While initial feedback was mostly positive, it wasn’t long before elements of the initial vision started to fall away. The building still retains the “urban fresh” branding, but that long ago lost any meaning. As a resident on the street, I’m sad to see the Sobeys close. It was great to be able to walk down the block to pickup some milk or a last minute ingredient. I do think the store suffered from long lineups at the checkout (and no express or self-checkouts) and generally indifferent staff, and that made the experience of shopping there much less enjoyable than it could have been. Though prices did come down over the years, they were still higher than other locations, such as Save-On-Foods over on 109 Street. What’s the impact on downtown? The closure is a loss for 104 Street and downtown, no question. It’s not fatal however, and with new condo towers well underway and the addition of Earth’s General Store in place of the old Pangea organic market further north on 104 Street, I don’t believe the loss of Sobeys will have a lasting impact. Demand will continue to grow as more and more people choose to live downtown and all those new condo towers fill up, and I imagine finding a new tenant for the space today will be much easier than it was back in 2007. Unlike in the past, 104 Street isn’t a gamble anymore. Sobeys leased the space in Cecil Place, there will be no covenants impacting the ability of another grocer to move in. “That’s not applicable for this location,” Keri clarified. She said the majority of the Sobeys locations being closed were leased. What will replace the Sobeys? That remains to be seen, but there’s few other locations downtown that are as attractive as the corner of 104 Street and Jasper Avenue. If I could wave my magic wand, I’d love to see the location turn into a year-round space for the City Market. One can dream, right? Unfortunately, the 104 Street store just hasn’t worked out for Sobeys from a business point-of-view. “We want to thank the community downtown who came in and supported the store,” Keri said.